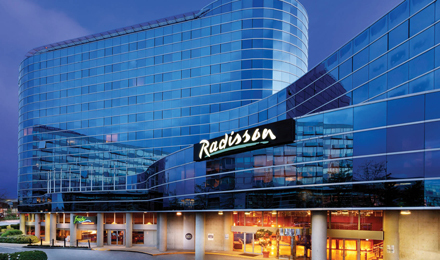 Feel at home in Freehold with free Wi-FiMake your visit to New Jersey more comfortable at Radisson Hotel Freehold, which features 121 rooms and suites with modern amenities like a flat-screen TV and free Wi-Fi. Earth tones create a soothing ambiance in every room, and down comforters and feather pillows lull you to sleep at night. When you wake, brew a fresh cup of coffee and get to work at the large desk. Traveling with family or friends? Our Deluxe Suites feature a separate living room, two TVs and sleeper sofa. If you’re here for work, consider upgrading your stay to a Business Class Room. Reserve a Guest Room and enjoy a choice of one or two queen beds and all standard amenities, including a coffeemaker, an in-room safe, free Wi-Fi and a mini refrigerator. This comfortable room features one spacious king-size bed and all the perks of a Guest Room. For extra space and amenities, consider the Deluxe Suite, featuring a bedroom with one king-size bed, an armchair with an ottoman and a flat-screen LCD TV. Stretch out on the full-size sleeper sofa to watch TV in the separate living room, or take advantage of the bathroom’s premium rain showerhead to feel more refreshed. Our romantic Bridal Suite features a master bedroom with one king-size bed, an armchair and a flat-screen LCD TV. Relax with your loved one on the sleeper sofa in the living room while sipping a drink from the bar. The master bathroom includes a rain shower with four jet-spray heads.